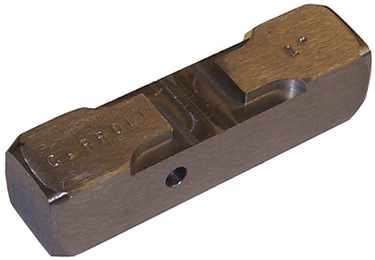 A determining factor for drawing uniform clips is moving the proper amount of steel. This, for some farriers who don't draw clips daily, can be a problem. This tool can help solve that by enabling the user to be more consistent and accurate when making clips. Using 2 or 3 blows, drive this tool down the hardie hole, through the thickness of the hot shoe where you want the clip. The hole in the clip starter shows you when the correct depth is reached. Pull the shoe out, letting the tool fall out of your way and flatten the bulge of hot steel on the clip horn or anvil face and you have a perfect clip. Available for 1 inch hardie holes.